Yay! Finally caught up to all the RDP prompts. Sgeoil introduced me to a new word this week: codwopple! Cool, right? The Ragtag Daily Prompt now has it’s own blog site called the “Ragtag Community“. Each day of the week a prompt is presented by a different person. Come and participate by posting writing or images evoked by the word and add your pingback or link to the comments there. Hope to see you at Ragtag Community! oops, darn, you’re right — and I did the right 4 syllable count too. Don’t know how I came to mispell it because I kept saying correctly. I’ll fix it now. I thought it was a good idea to. When you first post something, an email gets sent to the followers of the original post — so everyone got the wrong spelling. When you make a correction, they don’t get an updated email. The only way to correct it is to send a new post — oh no, that’s what i should have done — too late now. I figured if they went to the actual post (which is something I do), then they’ll notice the different spelling and reading your comment, they’ll realize I realized I’d mispelled it because you reminded me. Everyone makes mistakes so it’s good to have friends give you a heads up so that you can correct public mistakes. That is very thoughtful of you, and I am very happy to have been able to help a friend, indeed! Great stuff. Never thought to meet ‘coddwopple’ and ‘fair’ in the same sentence. Oh, fair warning margaret. I mispelled the word. It should have been “coddiwomple” insted. Irene pointed it out to me. So sorry! I’ve corrected everything now. Thank goodness I don’t have a million followers or we could have a new word on our hands due to a mispelling — that how “clew” became “clue”, lol, with a new meaning too. Thanks for the lovely comment. I really appreciate it. As I am a fellow prompter, I try to do all the prompts even if I’m really late and have to go back to finish them off. So that’s how I learned a new word and introduced it to you all, the rippling effects of a blogs. Now if a bunch of bloggers start using it, we may resurrect the word and it may move from Old English back into New English, lol. Well, I really think this is great and am not too sure a new/made up word would be just as good…because you are dreaming at the fair, so anything is possible. 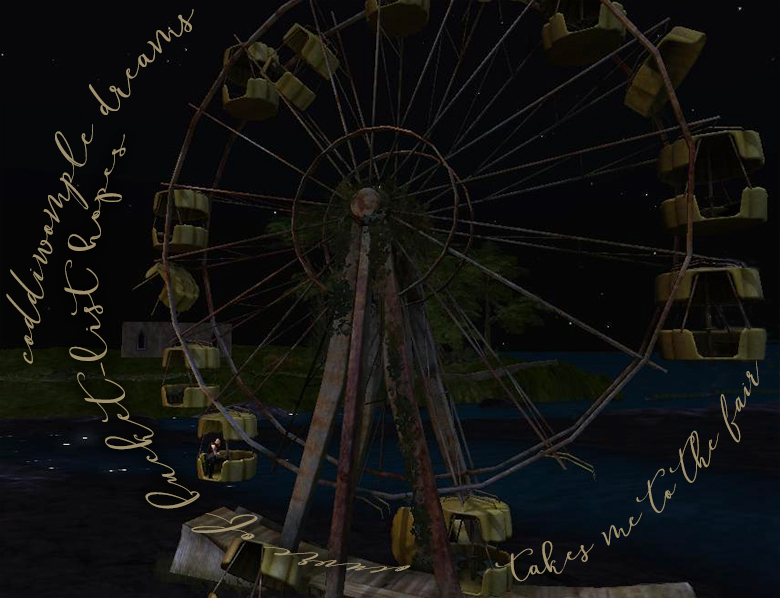 I really like the words looping around the ferris wheel. I did spell wrong at first (codwopple) but have corrected the spelling. Although, now that I have corrected it, the old word has this image flashing in my mind of someone hitting a cod with the word “wop” as the sound of the hit in cartoon above it — like the old batman show when they were fighting. Thank you for the lovely comment on the imagery of the words “looping around the ferris wheel”, first time I’ve tried something like that.